HELENA, Mont. 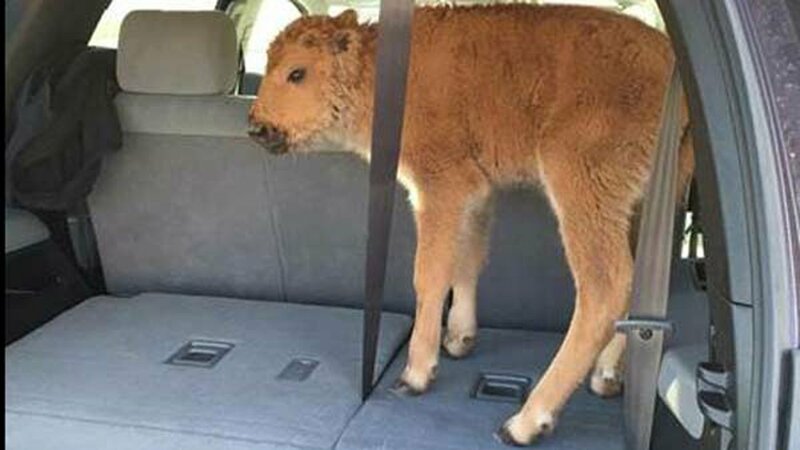 -- A bison calf that tourists loaded into their vehicle at Yellowstone National Park because they were concerned for its welfare could not be reunited with its herd and had to be euthanized, park officials said Monday as they reasserted the importance of avoiding wildlife. The incident last week and several other recent cases led to fresh warnings that park rules require visitors to stay at least 25 yards from all wildlife and 100 yards from bears and wolves. Visitors brought the newborn calf to a park facility on May 9, which officials called a dangerous move because adult bison are protective and will attack to defend their young. Rangers took the animal back to where it was picked up, but they could not get it back with the herd after several tries. "The bison calf was later euthanized because it was abandoned and causing a dangerous situation by continually approaching people and cars along the roadway," the park said in a statement. The visitors were cited for touching park wildlife and fined $110, Yellowstone spokeswoman Charissa Reid said. She declined to name the visitors or issue a copy of the citation amid the investigation. In another recent high-profile case, a woman was seen on video trying to pet an adult bison as it rested on the boardwalk around Old Faithful. In another, tourists posed for photos dangerously close to bison that had caused a traffic jam on a road. Five visitors were seriously injured last year after getting too close to the massive animals. Approaching wildlife also can affect their well-being and survival, possibly causing mothers to reject their offspring, park officials said. Such reminders are included on Yellowstone's website, in information handed to visitors as they come in and on signs throughout the park, Reid said. "This year we've added translations of the safety signage and provide park newspaper translations in a number of different languages," she said in a statement.